After the coronations of George V in 1911, George VI in 1937 and of Elizabeth II in 1953, it was decided to sell off some of the trappings of the events. After each of the Coronations the chairs and stools which the guests had used were offered for sale to with first refusal given to the people who had occupied the seat at the ceremony. As they offered a unique and lasting souvenir of such a great occasion they were eagerly snapped up. The chairs and stools from the coronation of George VI were made from limed oak and were upholstered in a dark green velour fabric, while the ones from Elizabeth II’s were made from silver powdered British oak and upholstered in a regal blue velour fabric. Both were stamped underneath with the sovereign’s initials. In style they have overwrap seats and a full padded back rest which has the monarch’s initials and a crown embroidered on the front. The chairs were used by the more important guest while the stools were allocated to the less important people. The original sale price in 1953 was £7-10-0d for a chair and £4-7-6d for a stool (£7.50 and £4.371/2 respectively.) Putting this into perspective the average weekly wage in 1953 was £9.25. 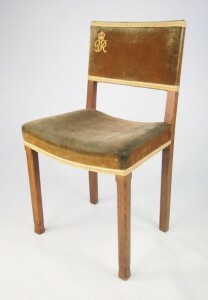 Chairs made for the coronation of George V are a good deal more difficult to identify. Looking like an ordinary dining chair from the late Edwardian period they have drop in seats, square legs and pierced back splats. Underneath they are stamped with the words George V Coronation, a crown and a place number. They are also scarcer because fewer guests were invited to the Abbey than for either of the other two coronations. In 2011 a firm of auctioneers in Newcastle discovered that a matching set of four chairs they had valued at £20-£30 comprised two coronation chairs and two matching ones made by the original manufacturers, B North and Sons of West Wycombe. They presumed that the two Coronation stamped chairs were bought after the Coronation and then two more commissioned to match to make up a dining set. The revised estimate added a nought to the original estimate.